St. John's senior captain Aidan Fox has been one of the best defensemen in the region this year. The top two seeds in the region remain alive in their hunt for a CMass title and beyond. Saturday's game at Foley Stadium will feature the Pioneers of St. John's and the Indians of Grafton, two teams with a combined three All-Americans and many other players at the top of their positions in the region. The Pioneers won the only meeting between the two squads, an 11-8 home victory in late May. The game is scheduled to begin at 2:30 pm, but storms entering the area may force a delay or rescheduling. Either way, here is what to watch for when these two teams meet up again. Indian senior All-Americans Tyler Reilly and Bryan Rotatori are two of the best players in the region, but they were uncharacteristically quiet in Grafton's semifinal win over Shrewsbury. The high-scoring duo scored only two points against Shrewsbury (1G and 1A from Rotatori), and coach Alan Rotatori admitted that his team may have been nervous. The last time these two teams played, Reilly recorded a hat trick, but Rotatori was stifled early by a hard-hitting Pioneer defense. 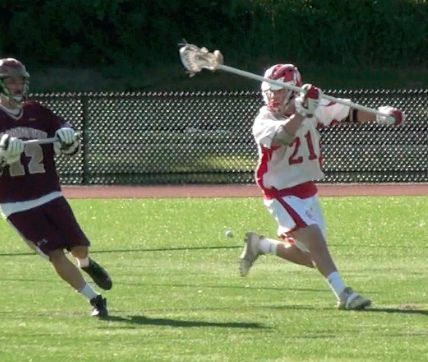 It seemed like St. John's pole Aidan Fox gobbled up every ground ball in Rotatori's area, and did a great job defending the All-American middie in the offensive zone. How Rotatori will adjust to the St. John's defense, and if Reilly can return to form will be huge questions for the Indians as they attempt to win their first ever Central Mass crown. The Pioneers feature three of the best attackmen in Central Mass in All-American Hunter Burdick, senior Josh Freilich and junior Drew Smiley, so they obviously like to initiate offense with their attack. But, St. John's has enjoyed breakout performances from junior midfielders Kevin Butler and Patch Ryan in recent weeks. While St. John's is still going to be an attack-heavy offense, the fact that the midfield is getting more involved prevents teams from cheating over to the Pioneers' explosive trio. If those two, and other middies, can at least earn the respect of the Grafton defense, it could be a big day for the St. John's offense. Both of these teams have All-Americans and star players, but they wouldn't be here without the play of some under-the-radar guys that have excelled this season. Without the outstanding play of A.J. Arnold in net, the Pioneers don't get past Algonquin in the semis, and their quarterfinal matchup with Westboro becomes far more interesting. I already mentioned him above, but Aidan Fox is having a sensational year on defense, and he may have been the biggest reason St. John's was able to defeat Grafton the first time. On the Grafton side of the field, defenseman Jon Coughlin has led a stingy defense that is often overshadowed by the Indians' explosive offense. Goalie Eric Thompson was outstanding against Shrewsbury, keeping his team in the game when the Indian offense was struggling, and freshman Chase Kapuscienski may be undersized, but his energy has sparked Grafton on more than one occasion this season. While stars like Burdick, Smiley, Rotatori and Reilly will surely have a large impact on this game, don't be surprised if things turn on the play of one of the "unsung heroes" I mentioned above.